YUTOSHI: Immersion of tea bowls in warm water. The clay used in pottery, unlike porcelain and glass, easily absorbs water. Due to this water-absorbing property, a feature of pottery wares is that longer they are used, their color will start to take a different hue and their luster will deepen. Although this is a part of the beauty of pottery wares, when handled inappropriately, a pottery ware may be ruined due to the development of unpleasant odor or mold. Before using a tea bowl for the first time, it should be immersed in lukewarm water for about 30 minutes, which then should be dried naturally till it is completely dry. When this procedure is repeated for about a week, the tiny gaps between grains of clay are tightened and the ware becomes more robust and stain-proof and produces less odor particular to clay. Although a new or little-used raku tea bowl may produce a strong odor particular to clay when hot water is poured in, this does not mean that the bowl is defective. Please make sure to immerse the bowl for a few minutes in lukewarm water before preparing powdered green tea (matcha) in your bowl. 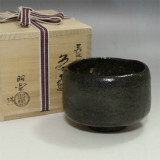 However, raku ware may start to melt and go back to clay when immersed in water for a long period of time. Please be careful especially with raku tea bowls whose foot is unglazed. After being used to prepare matcha tea for three to four times, the odor of the bowl will diminish and will almost or completely disappear eventually. You may still find that a residue of odor remains with some bowls, but please be patient and continue to use them by preparing strong green tea inside. The more you use your tea bowl, the color of the bowl will take a different hue gradually and its luster will deepen. This can be said to be the beauty of raku tea bowl. It may take up to one week for smell to diminish with some bowls with strong odor. Preparing strong green tea in the bowl or leaving water that has been used to wash rice for few hours and washing it off are some of the effective ways to reduce the odor. The tea bowl should be immersed in hot water that can easily be touched with bare hands and washed by using your hands or a soft cloth. Please do not use any dishwashing liquid when washing your raku bowls. As the surface of pottery wares is rough and uneven unlike that of porcelain wares, it absorbs the detergent which leaves its smell to the bowl and may ruin your palate next time you use it to drink tea. After washing your bowl, please leave it out to dry naturally and do not put it away in a box immediately (raku bowls need to be left out to dry for about 3 days during summer or 1 week during winter). Closing bowls inside boxes immediately after use may cause the remnant water in the clay to rot, which then becomes the cause of unpleasant odor when hot water is poured in the bowl. Be sure not to wash bowls in a dish washing/drying machine or used them in a microwave oven as it can cause them to chip or crack. Medome (Sealing): How to fix water leakage. There are a lot of holes in pottery, besides the visible ones, such as bubbles that you cannot see with the naked eye. From these, when dirt or moisture enter, it may cause stains or mold. To prevent stains and smells, these small holes must be covered. If you use water that has been used to wash rice, the starch quality of the rice serves to fill the holes on the surface. 1. Fill the bowl with rice water (or batter, if you do not have any). 2. Boil it for 20 minutes on a low heat. 3. Cool down the pot like that, wash the bowl and let it dry naturally. If you find the above method troublesome, skip the boiling process, and instead, it can be effective to just soak it in the rice water for a few hours. You can also prevent water leaks by using thick rice water.